Let's not under- estimate the simple pleasures of a well-made, modest wine well matched with appetizing fare; and a link to a new E-book about good cheap wine. Balanced and food-friendly: What more should we ask of a generic Chianti for well under $10? What's wrong with cheap wine? At least among a certain segment of the wine-loving community (let's not call them "snobs"), there's an attitude that no inexpensive wine - and certainly no wine made in large quantities by an industrial-scale producer - can be worth drinking. I've never had a problem with inexpensive wine. Even in these inflationary days when it's hard to find wines of much interest for less than $10, I'm always on the lookout for modestly priced wines of real value. But quality has to be there, or more specifically, the combination of quality and value that wine geeks call "Quality-Price Ratio" or "QPR." Personally, I can't deny an intuitive preference for artisanal over industrial producers; and, unfortunately, based on hard experience, I harbor a growing cynicism about the chances that an under-$10 bottle will please me. Still, it can happen. And when we get to that mythical economic bottom line, the question is not who makes the wine, nor how much it costs, but whether the wine is good. What constitutes "good" in an inexpensive wine? It's probably not reasonable to expect a wine with the kind of mind-blowing complexity and harmony that makes us hear choirs of angels sing. But it's not too much to expect a wine to be (1) balanced, (2) interesting, and, for extra credit, (3) food-friendly. Life is too short to drink boring wine, and if I simply want an alcohol-delivery system at the lowest possible price, I'd probably be better off going with a pint of the cheapest available vodka. Still, let's not underestimate the simple pleasures of a well-made, modest wine, well matched with appetizing fare. In my quest for wines like this, I try to improve my odds by hunting for bargains among the wine regions and grape varieties that have consistently pleased me, and conducting triage in the low-cost sector by trusting the producers and importers who've earned my respect with consistently good wines over the long term. This approach worked reasonably well with today's featured wine, a generic Chianti called "Caposaldo" from an unknown producer (identified only on the back label, in tiny print, as "I.C.R.E." of Terrossa di Roncà near Verona, a long way from Tuscany), brought to the U.S. by a large New York importer, Kobrand Corp., whose portfolio includes plenty of more-than-respectable wines. My tasting report is below, but to make a long story short, it's a good Chianti, not a great Chianti, on the light-bodied side but certainly both balanced and interesting and characteristic of the region and its grapes. It went well, as a basic Chianti should, with a sizzling pizza, and it was a fine value at its $8.99 local retail price. I recently ran into an Atlanta-based wine "geek," Ed Gandia, who has taken the quest for good cheap wines about as far as it can go. Ed tasted a huge number of cheap wines - in many cases, taking a bullet so you won't have to - in an effort to build a comprehensive directory of specific wines and producers whose under-$10 wines pass his muster. 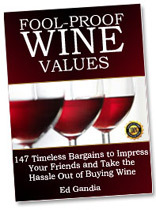  Are readily available at wine shops in the U.S.
"Fool-Proof Wine Values" is a downloadable E-book, available online as a PDF document (but you can print it out at home if you prefer to read it on paper). Ed sells it for $19, with his 100 percent, 60-day, no-questions-asked, money-back guarantee. FOOD MATCH: Mouth-watering acidity makes it a fine match with the tangy tomato sauce, mixed toppings and creamy mozzarella cheese on a well-made "Quattro Stagione" pizza from a good local shop. VALUE: Balanced and food-friendly: What more can you ask from a generic Chianti for well under $10? WHEN TO DRINK: Not a cellar keeper, but it should fare well on the wine rack for a year or even a few years.